What is War of Emperium? 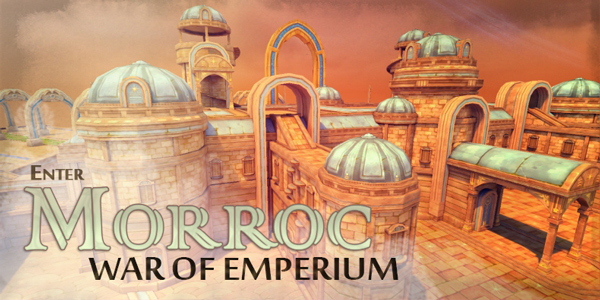 War of Emperium is your chance to pit wits and power in the biggest guild battle ever. Not only is it a battle between two guilds and one castle, but now there are several fortresses for which dominance can be acquired. In this venture, players will have access to a wide variety of siege weapons and defensive items. These items help players deal massive amounts of damage from a distance or may be used to protect their allies in battle. Players must be a member of a guild. Just guilds who are in WoE channel can fight for Castles or Fortress. Talk to WoE entrance NPC in Morroc or Prontera. If your guild already has an emperium, Knight Head Shun will allow players to warp to your own fortress while Knight Subdirector Gyle allows players to warp to one of the starting points in the battlefield. During War of Emperium time, the region will be open as a special PvP Zone where players can earn Blood Points by killing other players. However, unlike Colosseum, players will lose Blood Points upon death. Occupation Score: Quantifies the cumulative time from the start of WoE to the time when the Castle Emperium is destroyed into a number. When the Castle Emperium is destroyed, Occupation Score will be accumulated again from the time of its destruction. Even if the Emperiums are being protected by a defending guild, that guild can’t win if the Occupation Score is lower than other guilds. If the score is tied, the guild who owned it last will be the winner. A total of four guilds can reap rewards from Prontera War of Emperium, meaning that four separate guilds can take ownership of the castle and three fortresses. Castle rewards shall be the same as they are for the current winners of the War of Emperium. Guilds who got Emperiums from Fortress get reduced zeny tax on zeny spent at vendors and receive a Unique buff wich gives +500HP/13% Movement Speed Increase. You can take ownership of each castle or fortress by destroying the Emperium of that castle or fortress. The Occupation Buff can be acquired by using the same method as before (owning the castle), however, if castle ownership is taken by another guild because of the owning guild’s lack of Occupation Score, the Occupation Buff will be deactivated. WoE will not be finished, but will begin again after a short period. The castle gate and gateway will recover when WoE begins again, but with decreased HP than before. Ownership of the castle will be decided according to the castle Occupation Score. The guild with the highest score will be the owner. In case of the fortresses, regardless of castle Occupation Score, ownership of the fortress will be given to the guild that occupies the fortress when WoE is finished. The castle gates can be removed by using an orb. During WoE, Mastery Point death penalty will not be applied. Base occupation buffs, which used to be acquired when occupying a base, won’t be applied anymore. Flying Kafra’s flight path, which makes it possible to move from castle to fortress directly, is eliminated. You can move to the store location from the current location by using /exit or /escape command. However, you can only use it once an hour. There are two starting points, you may use the flight Kafra service to enter during battle. There is one castle, three fortress and three bases that can be sieged. Bases can’t give owner buff. The castle is closed by two gates and a Main Gate to protect access to the East and West Fortresses. The South fortress has an Orb to open Main Gate. Prontera WoE map has various monsters and bosses around the East Fortress. The War of Emperium is a guild versus guild siege battle. Your fellow guild members are your battle allies while members of other guilds are your enemies. All the guilds participating will have to compete with each other to attack and take the fortress. Siege weapons and defensive items will be at your disposal! Attackers gain an advantage by taking smaller Emperiums that will provide your guild with unique buffs. Once the gates are destroyed, attacking guilds will face off against guardians protecting the main fortress Emperium. The guild that destroys the Emperium become the new owners, and will be the defenders of their spoils in the next round of the War of Emperium. There is one castle and two fortress that can be sieged. The castle is closed by three gates, the western fortress has an orb that when destroyed will open the eastern gate to the castle. Destroying the orb in the east fortress will open the western gate. The castle has 2 key positions, the upper level and bottom level. The top level can be accessed through the western and eastern towers. Destroying the southern gate will allow players into the lower level that houses the castle Emperium. There is a Garden to the north of the castle that houses various monsters and a boss. Players must be in a guild. Guilds that are inside or outside of the fortress may participate. Guilds that own the fortress will can be warped inside the fortress where they may hold. Guilds that do not own the fortress will be warped to the battlefield. Talk to the WoE entrance NPCs in Morroc to enter. Knight Head Shun will allow players to warp to fortresses. Knight Subdirector Gyle allows players to warp to one of three starting points. Siege Catapults (one guild member can buy up to 10 siege catapults) This feature is open to all players. In the War of Emperium zone. PvP is open. Players can kill other players to earn Blood Points. However, unlike the Colosseum, players will lose Blood Points upon death.